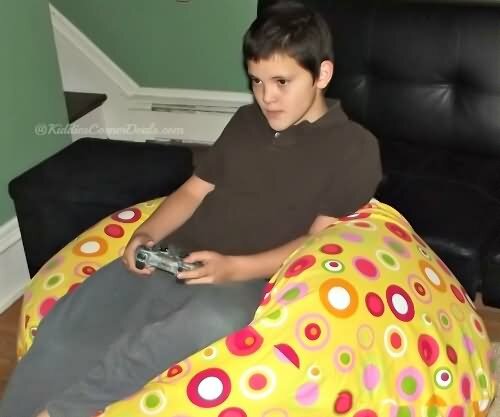 I was thinking the other day how great bean bag chairs are for gaming while watching my daughter and her friends having such a great time during a sleepover. (Since I'm always thinking about bean bags!) They looked so comfortable while screaming and carrying on - jumping then plopping back down on their bean bags. There's no way they could be having THAT MUCH FUN on traditional seating. My couch looks really nice and goes great with my home decor, but it's leather and quite honestly, it's slippery. Plus, I don't really like it when a gaggle of girls jump up then plop down on it a thousand times. I paid way to much for this couch to have to re-upholster it! Anyway, I mentioned how much fun everyone was having playing video games and we got to talking about how far gaming has come and how technology is evolved so much. It was a very interesting conversation, especially since I'm practically in the dark ages with my knowledge and my friend is quite up-to-speed. So I asked him to write a quick article about his thoughts on gaming technology for my blog readers. He took on the assignment and came up with this awesome blurb. I suggest you show it to your children for feedback, as it could be a great gift list for you and your Parent-friends who may be just a clueless as I am about what kids like nowadays for playing video games! This is the coolest headset I’ve ever used. It’s got 7.1-channel surround sound that gives you every little water drop sound in your game without blasting away your ears. This is one of those new pieces of technology that really puts you in the game. It’s got tons personalized controls, including whether or not you want to hear your own voice so you can check whether or not you're being loud and obnoxious. I hate changing batteries, making sure your controller is plugged in, or starting up a game only to find out your controller is dead. With these, you just set your controllers in the stand, and they charge while you’re not playing. I love the ones that glow cool colors, like the eForCity one for Wii, because what’s the point of having cool video game stuff if it doesn’t look cool? You can get any brand you want, but I trust and love Mad Catz. These pads are AWESOME for arcade games, and totally give you that retro feel without having to pump quarters into a machine. I love getting super good on my controller at home and then showing off at arcades. People still go to arcades right? Parents and other *older* [side note from me: my friend is in his twenties, so I guess he considers me "old"] people get really confused about using my game controllers to watch movies. Yes, you can use game controllers to control your tv, etc. Anyway, these remote controls give you all the buttons you’d want for media playing. The one in the link above can work with other devices too. This is for when I don’t want to hear my friends’ voices, and don’t want to go get my computer's keyboard and hook it up to my Xbox. Plus, trying to write anything with the onscreen keyboard is a drag. This thing attaches right onto the bottom of your controller and it’s about the size of a cell phone keyboard. Okay, so I’ll admit I was a little underwhelmed when all you could do was play ping-pong with it, since I can play tennis on my Wii, but it’s come a long way since then, and there're all sorts of cool games with it. There are lots of different shaped controllers for it too, like swords and bows and stuff that make me totally geek out. Once you clear everything out the room, shut all the blinds and stop slouching (yes, good posture is more easily "read" by the game's sensors), the kinect is totally awesome! If you get past the eeriness of a digital you doing what you do, you really get to experience what it’s like to be in the game. You might be able to cheat and remain seated while playing your Wii or PS Move, but this thing makes you actually get up and move, so you can judge whether that’s a good thing or a bad thing. I’ve been wanting my home console to have cool light-gun options since I blasted away a pocketful of quarters on Time Crisis 3. Don’t ask me why, but Resident Evil games on the Wii just get easier when you’re holding a gun-shaped Zapper in your hand. The disadvantage is that not all games use the right fire button, and you can’t always change it, like in Metroid Prime. Oh well, Samus doesn’t carry a gun anyway. Dry duct taping the Wii controller to your hand so you have an arm mounted blaster. I’m sure that will look cool. Because not every video game makes you get up and dance. It's easier to play video games when you're sitting as close to the floor as possible. Bean bags are nice because you can actually sit upright and still be totally relaxed in it, and you can move them around a lot easier than you could move an armchair. Plus, like Jade's sleepover scenario, kids can have tons of safe fun and no one is falling off the couch and bumping their head! Sadly, blowing in the cartridges doesn’t work when your games aren’t cartridges (remember the days when we had video game cartridges?!). Anyone in my family who didn’t just drop 60 bucks on a new game doesn’t seem to have the same reverence for it, and so one of my discs will inevitably get scratched. You can get special creams that magically fill in the scratches, and little spinning disc cleaners. It’s a good buy for anyone since you can use it on your movies too. You can get these anywhere like Best Buy or Amazon. So, dear readers, try one or a few of these gaming accessories and you'll get way more enjoyment while playing. Maybe everyone in the family can get in on it and gaming can become a family night filled with quality, fun time! Put these on your Christmas or Birthday gift list and you'll be the favorite "cool" parents in the neighborhood! Thanks to Mick for this fantastic article! I could not have EVER written it myself!